Sacred literature from various lands makes us familiar with the idea of a day of judgment on which the kindlier deeds are weighed against those harsh to determine the rewards of the soul in the afterlife. Almost every religion teaches that in proportion to man�s adherence to its moral code shall his future be free from tribulation. To picture in the sky this process of weighing the good against the evil, no more easily recognized symbol could be found than the Scales. But in addition to the purpose of their use, the Scales also present to view two dissimilar entities united by a common purpose; two spirits, as it were, represented by the circular pans, each dangling free to move in its independent orbit, yet both united by the beam to which they are attached. The Scales, therefore, is also a most fitting universal symbol of marriage. Those who so carefully traced the constellated glories in the sky to make this universal symbolism still more obvious and complete, would also seek to place the picture in such relation to the zodiac that the position of the Sun at the point so designated, should both indicate a union representing marriage and a balance of two nearly equal, but divergent forces. The most familiar union, and the most familiar balance between contending forces, are night and day. So common to our lives are they that they space and regulate the hours of our endeavor. We awaken and we sleep at their behest. Light becomes a symbol of life and activity, and darkness of sleep or death. Those days in which the hours of darkness exceed the hours of light may well, therefore, be placed in one pan of the annual scales, and those in which the hours of light preponderate may fill the other. Thus day and night are weighed in Libra�s Scales; and the Autumnal Equinox marks the point where summer and winter signs are married, one-half the zodiac balanced against the other. The Sun thus moves out of the harvest sign where the grain was cut, into the place where it shall be valued. The Produce of the fruitful period of the year is weighed, and the wholesome kernels are separated from the chaff. Such estimating of its worth, either of crops from the field or those from the span of life, most fittingly takes place when the vital forces, as symbolized by the Sun, have succumbed to those of cold and darkness. The Jewish people, retaining the old time significance of this period of the year—although their calendar in modern times has been permitted somewhat to go astray—still honor the passing of the Sun each year into the sign of the Scales. This custom dates back to Leviticus 24, where it is commanded "Speak unto the Children of Israel, saying, In the seventh month in the first day of the month, shall ye have a Sabbath, a memorial of blowing of trumpets, and holy convocation." 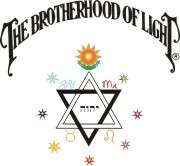 The year, of course, began with the Vernal Equinox, and Rosh-ha-Shanah is thus held the first of Tishri, or Libra. "Rosh-ha-Shanah is the most important judgment day, in which all the inhabitants of the world pass for judgment before the creator as sheep pass for examination before the shepherd. Three books of accounts are opened on Rosh-ha-Shanah wherein the fate of the wicked, the righteous, and those of the intermediate class are recorded. The names of the righteous are immediately inscribed, and are sealed ‘to live.’ The middle class are allowed a respite of ten days till Yom Kippur to repent and become righteous; the wicked are ‘blotted out of the book of the living.’"
One of the most important qualities of the human mind is the ability to weigh evidence and from a comparison of diverse factors to pass sound judgment. Every day of our lives we are called upon to make minor decisions, if of no greater importance than the amount and kind of food to be eaten, and on rare occasions to pass judgment which affects the fate of human lives. In racial tradition, one man above all others stands out as the symbol of unusual wisdom. As wise as Solomon, has come to express the very essence of discrimination; and while this Jewish king exhibited the keenness of his mind on many another occasion, it was a certain decision he rendered which first proclaimed that the wisdom of God was in him. It related to two contending women who stood before him for judgment. To understand its celestial significance it must be recalled that the sign of the harvest, Virgo, pictures an unmarried woman, and that she stands in the sky immediately before the Scales where judgment must be passed. Where the Sun passes from Virgo into the sign of the Scales, as previously indicated, is where the wheat is separated from the chaff and the value of the harvest ascertained. Thus were there brought before Solomon two unmarried women, each of whom, nevertheless, had a child. Yet as in threshing there is both sound wheat and worthless chaff, so was the harvest, or child, of one woman alive, and the child of the other woman dead. According to the story related to Solomon, the two women lived together in one house which certainly must have been the case if both were phases of Virgo—and a child was born to each, the difference in the children�s ages being but a matter of three days. Through the carelessness of one woman, the life of her child was crushed out in the darkness. This also is significant; for it is at this point that the Sun each year dies through the increasing weight of night. One woman claimed it was the other woman�s child who died, and that the other woman arose at midnight and finding her child dead, had stealthily removed the living child from the first woman�s bosom, and replaced it with the child that had died. But when the light came in the morning, the woman who had remained asleep, finding the child in her arms dead, also perceived that it was not her own, but the child of her companion in the house. This story and this accusation the other woman stoutly denied; and both women loudly proclaimed the living harvest as her own. Thus stood they before King Solomon, each disputing the right of the other to the infant. Summer and winter are divided, one from the other, not only at Libra, but also at Aries; an invisible line, called a colure, cutting the sky between the Vernal Equinox and the Equinox of Fall. The first of Aries marks the place where days and nights are equal in the spring, and the Scales marks where they are equal in the fall. And the sword held in the hand of Perseus has its tip almost on the line right across the sky from the judgment seat. This militant sword of Aries often is used as the symbol of cutting asunder of the celestial circle in spring, just as the cross as frequently is used to signify the waning strength of the Sun in fall; and, after all, even as summer and winter are but inversions of the relation of night to day, so also in its form does a sword present the inversion of a cross. Solomon, therefore, called for a sword to be brought to him and commanded, after the manner in which the equinoctial colure divides the zodiac at the point marked by the Scales, that the living child should be divided in two, one half to be given to one woman and the other half to the other. To this procedure one woman readily agreed, but the other would not consent. Virgo, in human anatomy, rules the bowels, and the Bible states: "Then spake the woman whose the living child was unto the king, for her bowels yearned upon her son, and she said, O my lord, give her the living child, and in no wise slay it." When she had said this, Solomon at once perceived that she was the real mother of the child, and the child was not slain, but awarded to her. Libra is the home sign of Venus, the planet of love; and in his wisdom, Solomon weighed the love of the women who came before him, and, convinced that love seeks to preserve the object of its affection and not destroy, passed judgment accordingly. A life was not sacrificed, but delivered to its rightful owner. It was this same doctrine that love lies at the foundation of life, here and hereafter, and that the harvest of years must eventually be judged on the basis of kindness and compassion, that in later days was set forth by the Nazarene as the commandment to his followers to love one another. Turning now from the teaching in reference to judgment, it should be noted that in the marriage of summer and winter the forces are not exactly equal; for each year there are seven more days of preponderating light than of preponderating darkness. Evil certainly is present in the world, but if the celestial correspondence holds true, it is not of equal strength with the good. Like summer and winter, they may be closely balanced in power, but if we could look close enough we should find that in the long run the good has a little advantage, and that consequently the world does make spiritual progress. 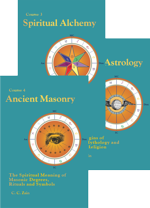 And followed far enough, this doctrine set forth in the starry symbolism of the Scales, where the Sun may be found each year from September 23 to October 23, reveals the use of evil, as well as signifying the paramount importance of love in human life. The Key phrase of this section of the sky is, I Balance. Those then born find a harmonious partnership especially important; and because in such a marriage spiritual qualities are engendered it gives this text: Not by One Alone May the Highest of All Be Reached, But by Two United Souls Who Are Exalted by the Sweet Reverberations of Holy Love. At the side of Virgo, the celestial Eve, the wise men of the east pictured the serpent, which is reputed to have tempted her. Virgo joins Libra, the sign of marriage, and Serpens portrays the marriage decanate of this marriage sign, through which the Sun moves each year from September 23 to October 3. It therefore represents, with a more precise significance, that point in the heavenly circle where summer and winter signs are joined in marriage. When positive and negative forces thus fuse and blend, yet at the same time their opposite pull is not exactly balanced, action results which takes the spiral form. Because such a spiral does not return upon itself, as does a circle, it is the typical motion of evolution. Thus it is that when the 179 days of winter darkness are married to the 186 days of summer light, the result is not a perfect equilibrium between ignorance and knowledge, but a spiral which ever rises, even though slowly, away from darkness and toward more light, much as the front spiral formed by Serpens in the sky lifts its head to a plane above its body. Because of its wavelike motion of travel, its coiling, and its phallic significance, the snake has been used throughout the world as the symbol of virile power and creative action. Hence it came to be the emblem of the Sun, the source of such creative energy. Instead of using the head of a lion for the sign Leo, therefore, its accepted astronomical hieroglyphic is simply a conventionalized snake. This serpent of the first decanate of the marriage sign, however, expresses something more than virility and desire; for near its head, and another near its tail, may be seen loops which present to view the spiral. It is indicated, therefore, that the creative powers have been used, or enter into a combination, to produce a form which tends to progress, or is retrogressive. At all times the surface of the earth presents a marriage of light and shadow, one half being in the sunshine and the other half in night. Yet these areas of light and shadow are not constant, but move as the earth turns on its axis. Furthermore, due to the inclination of the earth�s equator to the apparent path of the Sun, the lighted half of the surface of the earth moves to the northward half the year, and to the southward the other half, the perpendicular Sun tracing the outline of that spiral to which we owe the seasons. Sun and Moon among the orbs are typical of the Father and Mother principle. While the Moon revolves around the earth, the earth revolves around the Sun, making the Moon�s path not a circle, but a wavy line in form like that of Serpens in the sky. 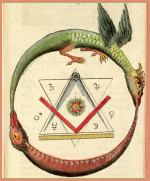 At New Moon the Sun and Moon are united, and from thence on things of earth expand and grow, the united Solar-Lunar energies working in the direction of progress, as indicated by the higher plane held by the Serpent�s head. From Full Moon to New, having reached the region of divorce, things diminish and weaken, as indicated by the tail of the snake crossing a higher level than its body. That which happens in the sky also must happen on the earth: and the two halves of the Moon�s cycle in reference to her spouse, the Sun, represent two things common in marriage. The product of the union may be a force, or evolutionary movement which carries the pair higher and higher in their spiritual aspirations and practical endeavors. Such is pictured in the constellation by the loop near the Serpent�s head, which lifts it well above the body, where it is adjacent to the signs of light, the signs which mark the warmth of summer. Or it may result disintegratively, in a movement which carries them ever down to lower depths, as clearly shown by the loop far down in winter, which gives supremacy to the Serpent�s tail. The Far East brings us a doctrine of the serpent fire, and it is to be regretted that it has so greatly permeated our West, as many have suffered damage in trying to follow it. In reality, it is one of the questionable oriental temple practices. But when in Numbers 21, reference it made to fiery serpents, the obvious inference to be drawn is that the people Moses led likewise had contacted this serpent fire doctrine, which then as now was a common portion of the perverse temple practices of oriental priests. The Israelites had journeyed from Mount Hor by way of the Red Sea, to make a detour around the land of Edom, and were bitterly discouraged. The manna on which they fed while wandering in this wilderness, because it fell from heaven, is symbol of spiritual nutriment. As such it well represents the spiritual food husband and wife feed each other in the form of loving thoughts and high ideals. It is thus in direct contrast to the selfish purposes for which the oriental priests arouse and use the serpent fire. It would seem, therefore, as the story is given in the Bible, those led by Moses turned away from love and kindness and adopted the perverse notions of another race. "And the people spake against God, and against Moses, Wherefore have ye brought us up out of Egypt to die in the wilderness? For there is no bread, neither is there any water: and our soul loatheth this light bread. "And the Lord sent fiery serpents among the people, and they bit the people; and much people of Israel died. "Then in their dire extremity, they turned once again to Moses and begged his help. Because brass is a marriage, or fusion between copper, ruled by Venus, and another metal, the universal symbolism of many ancient lands made use of it to signify a union based on love. The brazen serpent, therefore, which Moses raised upon a pole, has the same significance as that other more precise scriptural passage; "Be ye therefore wise as serpents, and harmless as doves." It denotes that Moses taught his followers true wisdom in the use of the energies generated in marriage, and made them aware of the importance of love as the guiding principle, even as both doves and copper are under Venus� rule. So long as they sought to rouse and use the serpent fire for the attainment of selfish ambitions, they tuned in on the spiral loop pictured near the Serpent�s tail; and it carried them down to destruction and death. But when in wisdom they learned to utilize the powers engendered by holy love for the attainment of lofty aspirations and human betterment, they tuned in on the spiral loop pictured near the Serpent�s head, and it lifted them up, higher and ever higher, into those regions of spiritual life denoted by the adjacent signs of summer. The utilization of this love principle for the advancement of the race was an important part of the Stellar Religion handed down from Atlantis and Mu which found its way to various peoples. But perhaps no others gave it the supreme importance as did the Maya of Mexico and Central America. As a dominant note of architecture, to be found on bas relief and balustrade wherever jungle permits the unearthing of a temple, there is to be found some representation of the feathered serpent. Because birds fly above the earth, their feathers became the symbol of that which belonged to the spiritual plane. Therefore to portray the thought expressed in the sky by the loop near Serpent�s head, the Maya adorned a snake with feathers. In such a manner, even as did the brazen serpent raised on a pole above the sordid earth of the wilderness, did they symbolize that the energies of marriage were to be devoted to the development of spiritual powers and nobler characters; to indicate, that is, that the Serpent moves in a higher, more idealistic realm. In any marriage which is real, the closeness of companionship adjusts the vibratory rates of each quite completely to the other. A condition is maintained which commonly is called rapport, each, that is, tuned in upon the other. Thus do the thoughts and desires flow freely back and forth, each feeding the mate with spiritual food or spiritual poison. In any form of mental treatment, the image held in the mind of the person sending the thought is impressed upon the person receiving, and tends to make changes in the pattern of his life and actions according to its design. This is the fundamental principle in all forms of absent or other mental healing. If, therefore, the image held in the mind of the mate is an ideal, embodying nobler, more spiritual attributes, and this image is constantly vitalized by the emotional energy of a tender and adoring love, it becomes the most powerful influence known to develop, in the one thus treated, the spiritual attributes of character. And when each, in marriage, thus holds the image of the other in higher states than this, the spiritual evolution of both is vastly hastened and a high development of character assured. This was the teaching of the feathered serpent. But on the other hand, when married partners live in an attitude of finding fault, each with the other: when bitterness and strife creep in, and their thoughts go forth in resentment and discord, the one receiving the image thus vitalized is powerfully influenced toward developing the obnoxious traits thus mirrored, and the inharmonious forces injected into his finer form tend to disrupt and lead to failure and moral dissolution. As picturing the balance decanate of the sign of the balances, Serpens relates to marriage of opinions as well as to the marriage of people. Usually in any vital issue the views of opposite factions are extreme. Usually also, where there is strong contention, a compromise is more satisfactory than the triumph of either. This gives to the decanate its Keyword, Policy, and leads to the text: In Matters of Philosophy and in Matters of Action the True Course Usually Lies Somewhere Between Advocated Extremes. Krishna of India, according to the legends of that land, sought out and slew a noisome dragon whose poisonous breath withered the crops, bred famine, and whose movements through the countryside left death and destruction in its wake. In legendary Christendom it was St. George who played the role of valiant hero, and after long and violent battle, succeeded in leaping on the back of the scaly monster and driving his great two-handed sword straight through its wicked heart. "And I saw an angel come down from heaven, and having the key of the bottomless pit and a great chain in his hand. And he laid hold on the dragon, that old serpent, which is the Devil, and Satan, and bound him a thousand years, And cast him into the bottomless pit, and shut him up, and set a seal upon him, that he should deceive the nations no more, till the thousand years should be fulfilled: and after that he must be loosed a little season." This word, Satan, is derived from Saturn, the planet having special affinity for loss and sorrow, for evil and selfishness, for despair and desolation. 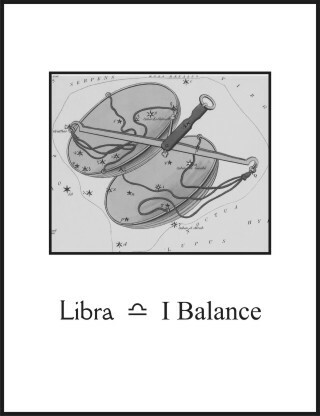 It has its exaltation in the Libra sign, of which the middle decanate is pictured by the starry Dragon, and olden people held that his home domain was the bottomless pit, where his victims stewed amid the smoke and heat of a never-ceasing fire of smoldering brimstone. 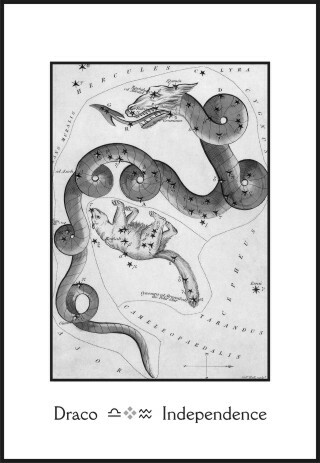 As it is a decanate of the sign of marriage which the Dragon pictures, it is quite obvious that universal symbolism points to some destructive union, both in the sky and on the earth, as the influence which the pictured reptile thus explains. 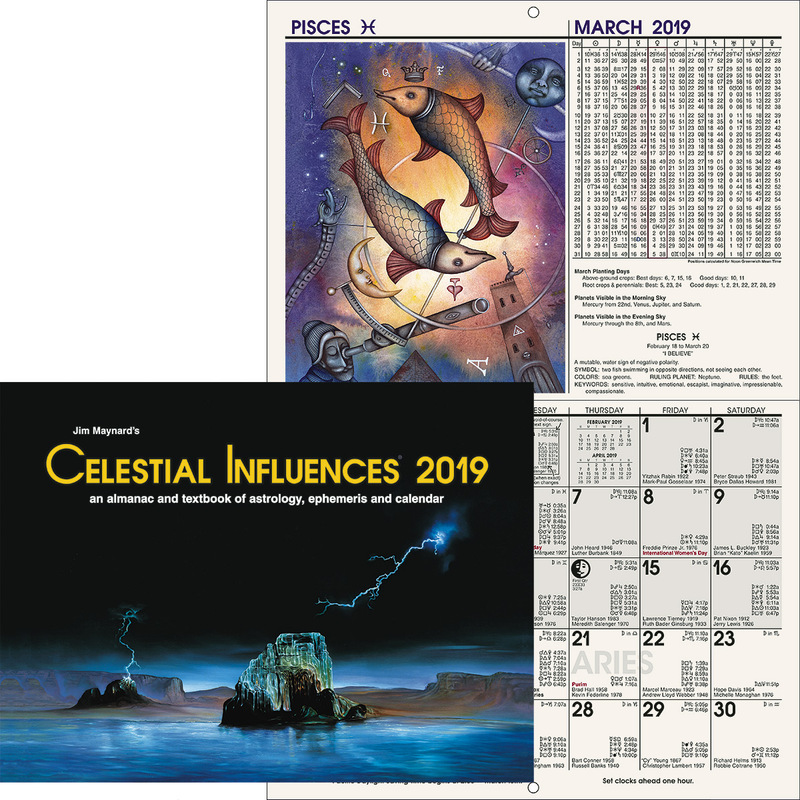 Nor is its heavenly significance far to seek; as not only in ancient times, but at the present day, the ephemeris gives the positions of the Nodes of the Moon, which still more commonly are called, the Dragon�s Head and the Dragon�s Tail. The Moon in its orbit around the earth does not follow the same path which apparently is taken by the Sun. This apparent path of the Sun is called the ecliptic. The orbit of the Moon is at an angle of a little more than 5 degrees to the ecliptic, so that even when the Sun and Moon are exactly in the same zodiacal degree, the same east-west position, they may still be several degrees apart in a north-south direction. As the diameter of the Sun or Moon is only about half a degree, the effect, so far as a shadow is concerned, is as if an object were slightly west of a house in the morning, but ten times the width of the house to the north or south of it. The two points, or nodes, where the orbit of the Moon cuts the apparent orbit of the Sun are called the Dragon�s Head and the Dragon�s Tail. When the Sun in the zodiac is farther from the Dragon�s Head or the Dragon�s Tail than 13 degrees at the time of Full Moon, the Moon cannot be eclipsed: but when it is within 9 degrees of either of these two places, a Lunar Eclipse must take place. When the Sun at New Moon, that is, when Sun and Moon are married, is farther than 19 degrees from the Dragon�s Head or the Dragon�s Tail, no eclipse can take place; but when this union of Sun and Moon occurs within 15 degrees of either of these Nodes, a Solar Eclipse is always present. 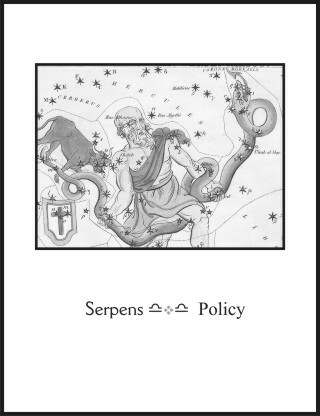 Thus it is that the relation of the Sun to the Dragon�s Head or Tail determines whether or not an eclipse takes place. And an eclipse, particularly an eclipse of the Sun, indicates some disaster in the region where it is visible. Symbolically, the Sun is then being devoured by the Dragon, or in case of a partial Eclipse, the Dragon gnaws at the disc of the Sun; a symbolism that is still taken literally by, and produces terror in, the more ignorant peoples of eastern lands. In China, where the populace spend far more energy in ceremonies to prevent misfortune than in observances to attract the good, the most dramatic spectacle of the year is the pageant and play wherein the Dragon is met and finally vanquished. This oriental version of the St. George episode is a gorgeous affair, rich in setting, artistically presented. As a precedent for the most approved of western plots, a fair damsel in distress arouses the sympathy of the gathered throng. This meek and virtuous maiden arrayed in loveliest silk, wears also decorations which proclaim her to be the goddess of the Moon, and as such the spectators give her welcome. Not long is her lovely presence upon the stage, however, before disaster threatens. From his lurking place within the shadows, a huge and scaly monster writhes out; a Dragon, exhaling fire. The smell of burning sulphur fills the air. The Moon goddess flees in terror, but finds her retreat cut off. She is hemmed in, crowded into a corner, and the vile reptile�s jaws have opened to seize her, when, with a shout and a rush, the hero comes upon the scene. In raiment resplendent with glittering gems, he is dressed to take the part of the refulgent Sun. The Sun god dashes to the rescue, and the monster thus attacked turns its attention to him. The fumes stifle the hero, the smoke from the creature�s nostrils blind him, the fire scorches his cheeks and the hair on his head. Terror grips the hearts of the spectators; for if the monster wins, the world is lost. This demon from the pits of hell almost gets the hero down. The Moon goddess, from the corner where in dread she crouches, utters an awful scream and holds her out turned hand before her eyes to shut the too terrifying spectacle from her gaze! The fate of the universe is weighed in the balance! But no! The hero only slipped, he is not completely down. He recovers himself, and with a mighty sidestep avoids the crushing weight, then vaults upon the scaly back and drives home his great two-handed sword. The Dragon is dead. The Sun god is triumphant. He gathers to himself the lovely goddess of the Moon, marries her then and there, and they live happily ever after. No less seriously do the Hopi Indians of Arizona consider the influence of the celestial Dragon. In their legends also, an eclipse is attributed to the Dragon devouring Sun or Moon. And their snake dance is the traditional ritual by which, among other things, the effect of a possible eclipse upon their crops can be avoided. They believe, as astrologers do, that where the shadow of a solar eclipse falls, is apt to be a region visited by pestilence, by catastrophe or by famine. And as their most frequent calamity is crop failure due to drought, their chief ceremony is staged particularly to prevent this evil. A picture of the Hopi snake dance reveals that the reptile carried in the dancers� mouth is in form the same as the symbol commonly used for the Dragon�s Head or Dragon�s Tail. He does not hold it in his mouth while he dances to prove his bravery; but to symbolize the eating of the Sun or Moon by the Dragon. The agriculture tribe who further south in Arizona built that famed house of many rooms, the pueblo of Casa Grande, also had a careful respect for the Dragon in the sky. The Sun is in the Independence decanate of Libra, pictured by this monster, from October 3 to October 13. And a hole was bored, by this people, through the many walls to the interior of the vast dwelling, so aligned that the rising Sun on October 7, when in the Draco decanate, and again on March 7, when in the Andromeda decanate, would shine through and cast its beams upon the central sanctuary. The union of Sun and Moon to ancient peoples was the symbol of the union of the Ego and the Soul, that is, of mind and spirit. The Moon has ever been the symbol of the indwelling soul. The Dragon, on the other hand, represents the environmental forces which tend to develop the reptilian traits of character, the cruel instincts and ruthless selfishness which shut out the light of spirit, and thus eclipse the soul. To the extent, therefore, an eclipse is total does it present a spectacle representing the soul or spirit devoured and destroyed by the powers of darkness associated with the struggle with physical environment. We perceive now why Yom Kippur, which is ten days after Rosh-ha-Shanah, and thus when the Sun enters the Draco decanate, is the most sacred of Jewish observances. Kippur means the atonement, the setting at one, the reconciliation of two parties, just as Sun and Moon are reconciled and united as one at New Moon, unless an eclipse is present. When there is an eclipse the light, or good, is devoured by darkness, or evil. This signifies the destruction of the soul, unless the powers of darkness and of evil, symbolized by the Dragon, are vanquished and the final atonement made. The whole purpose of evolution, up to the state of man, is through combat with environmental conditions and the struggle for physical survival, to develop the selfish instincts and the animal qualities of the soul. Difficulties are not overcome by weakness, nor is accomplishment made without aggression and courage. Those who permit the competitors for food, for mate and for shelter to force them to one side are not fulfilling the highest purpose of physical destiny. But when, and to such extent as, the abilities and possibilities developed in the fierce struggle of its animal past are turned to purposes which have for interest the welfare of all, does that soul cease to function on the plane of brute, and rise to something which we term divine. It has thus triumphed over the Dragon, and its atonement is complete. When it thus has reunited with its Ego, and the dark peril is past, it can find no joy in the pain or discomfort of any living thing. The text thus emerges: Deal Justly, Even With Thy Enemies; For it is Better to Suffer Evil than to Retaliate With Vengeance. When the masters of an ancient day traced a wolf in the sky it is quite certain they had in mind those qualities which then and now this creature most commonly is known to express. A wolf is a cunning beast, using its mind, as the mental decanate of the partnership sign would indicate. It is aggressive and cruel, runs in packs when that is an advantage, and hesitates not to kill and devour such a partner when it becomes so weakened or crippled as to be unable to defend itself. Thus does a wolf stand as the universal symbol of ruthlessness. "Beware of false prophets, which come to you in sheep�s clothing, but inwardly they are ravening wolves." The best commentary which has come down to us, perhaps, as to the full significance of this Wolf of heaven, and what its teachings are, is to be found in the widespread and symbolical story of Little Red Ridinghood. From your nursery days you will remember, I am sure, that the grandmother of this nice little girl was ill. As a dutiful granddaughter should, Little Red Ridinghood went to pay the old lady a visit, taking with her some cookies which she felt her ill relative would enjoy. Little Red Ridinghood, quite unmistakably, as the hero of the tale, must represent the human soul. The grandmother who was ill, and whose house was by the road at the other side of the wood, represents those people in the world who suffer afflictions of various sorts, and who are too weak and helpless to be able to defend themselves. They thus are symbolized by a helpless woman because the Moon is the ruler of women and of the Domestic Urges, those impulses which incline not merely to the care of home and children, but also to the care of the helpless old, and to ministering to such others as misfortune makes it impossible for them to care for themselves. The road along which Red Ridinghood went, with her basket of cookies on her arm, ran through the forest of human contacts which flanks the path of every life. There were flowers, and butterflies and beautiful birds to give interest and pleasure to her self-appointed task, and so full of joy was she with it all, that she sang a merry little melody as she danced along toward her work of mercy. Then all at once, out from behind the bole of a giant tree where he had been hiding, stepped a wolf. Red Ridinghood was badly frightened, but she knew there was no use to run, as the wolf could easily overtake her. So she said, "Good morning Mister Wolf, what a fine day it is!" And the Wolf, although very hungry, thought to himself: "Before I eat her, I will find out where she is going and what she intends to do, as this may lead me to something else I want." So the Wolf said, "Good morning, and where are you going so happily, and what do you carry in that fine basket on your arm?" He spoke so pleasantly, as people are wont to do when they seek to gain the confidence of others, later to despoil them, that Red Ridinghood was quite disarmed, and thought she had misjudged him in her first impression that he was intent on evil. So she told the Wolf all about her grandmother, where she lived, and that there were cookies in the basket, which she was taking in the hope to give the dear old lady a better appetite. The Wolf then thought to himself, as predatory people do, that it were better not to act too hastily, but to lay a cunning plan by which he might gain for himself every possible advantage, even though it meant more loss and misery to others. The old lady, according to Red Ridinghood�s account, was ill in bed and quite helpless. It would be an easy matter to make a meal from her, in the manner customary to his pack to kill and devour such members as became too weak to defend themselves. After that, he could wait for the little girl, get the cookies, and devour her too. In this manner, he would be able to gorge himself with food and more completely satisfy his lust for blood. He therefore smiled at Red Ridinghood, bade her good day pleasantly, and started down the road in the opposite direction from which she was going, so that she should have no suspicion he had any thought of her harm. But as soon as he was out of her sight, he made a wide, swift detour through the forest back to the road ahead of her, and ran swiftly to the house, where he made the expected meal from the ill old lady. It was not literally a case of a wolf in sheep�s clothing, but figuratively it became so; for no sooner did he finish with grandmother and lick his bloody chops, than he donned her garments and climbed into bed to doze, all prepared to look as much like the late departed as possible. When Little Red Ridinghood came to her grandmother�s house, she knocked lightly on the door. This awakened the Wolf from his after dinner nap, and as soon as he had adjusted the white cap as nicely as possible on his head, he called, "Come in." Said Little Red Ridinghood, as she entered the room, "My! Grandma, what a deep voice you have." Replied the Wolf from the bed, "All the better to call you in." Walking toward the bed, to deliver the basket of cookies, the little girl noticed how unusual her grandmother appeared, and said, "But, Grandma, what bright eyes you have." Said the Wolf from where he lay, "All the better to see you with." Then the child noticed the ears, where they stuck out from under the white nightcap, "And, Grandma, what big ears you have!" Answered the Wolf, growing quite excited by now, "All the better to hear you with. In his excitement he had opened his mouth quite wide, displaying its red cruelty, and Red Ridinghood, by now thoroughly alarmed, exclaimed, "Grandma, Grandma, what great teeth you have!" "All the better to eat you with," shouted the Wolf, as he threw off his disguise and leaped from the bed. In another bound he would have had the terror stricken little girl by the throat; but some passing woodsmen had overheard the hoarse voice of the Wolf, and had stopped to listen further, and now dashed into the house, axes in hand. Even as he made the leap for the child�s white throat an axe cut the Wolf down, and shortly nothing was left of him but the pieces. Predatory interests, cruel and ruthless, still speak to the public through the press, pulpit and radio, in a voice they endeavor to disguise as that of general welfare, but which in reality has for its purpose the influencing of all who will listen to come closer that they may more easily be despoiled. Their eyes are bright with avarice and greed, quick to note the slightest opportunity by which others can be placed at a disadvantage. They listen with big wolfish ears to the trend of popular interest, that they may utilize it for the benefit of their own self-seeking and human-destroying schemes. Their rapacious mouths are armed with teeth of war, pillage and destruction. Blood lust is upon them, and the suffering of sweat shop, of child labor, and of armed strife brings forth no thought of sympathy. But after a time the woodsman�s axe always cuts them down. Those who live through deceit and cunning, who exploit their fellow man, are inexorably doomed to final expiation. The Wolf as pictured in the sky no longer takes his toll of blood. No longer is he able to hide his wickedness behind the cloak of lawful practice and social respectability. He has met, not the woodsman�s axe, but the spear thrust of Centaurus. His tail and ears are drooped, his legs are crumpled under him, tongue protrudes, and the blood of death drips from his mouth. He has reached the certain fate of those who prey on others. Little Red Ridinghood escaped destruction; for she was on an errand of mercy. She was building thoughts of peace and joy, of good will, and of compassion for others, into her finer self. The human soul thus fortified may be despoiled of earthly things, but nothing can destroy its spiritual life, or filch its spiritual treasures. 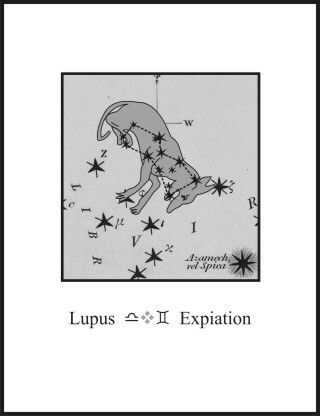 It should not be thought that those who are born when the Sun is in the Lupus decanate are more given to cunning exploitation of others in the interests of themselves. But it does seem that those then born, when they do turn their energies to such despoiling, more quickly are called upon to pay a dreadful penalty. It is the observation of this that gives the decanate its Keyword, Expiation. But aside from astrological considerations, anyone who cultivates within himself the ruthless cunning and heartless cruelty of the Wolf, cannot but attract disaster to himself in time. The thought cells of his finer body, given practice in cruelty and despoliation, sooner or later receive such stimulation as is necessary to cause them to work quite as energetically from the four dimensional realm, to attract similar misfortunes into the life of the one who gave them birth. Where the thoughts and desires find no sympathy and no consideration for the well being of others, even though the intelligence and body are human the soul is that of the Wolf. All should understand this text: It is Impossible for a Man to Injure Another Without Himself Being Injured, or for a Man to Benefit Another Without Himself Being Truly Benefited.